Meteo Rwanda, in collaboration with the International Research Institute for Climate and Society (IRI), has implemented the first phase of the ENACTS (Enhancing National Climate Services) initiative. The ENACTS initiative brings climate knowledge into national decisionmaking by improving availability, access and use of climate information. Meteo Rwanda staff has received a number of trainings on the different aspects of generating the datasets and developing climate information products. However, due to the recent reorganization at Meteo Rwanda, as well as updates to the tools used to generate historical data and information products, it was necessary to revise the training and update climate data and information products. The current activities, which are part of CCAFS-USAID Climate Services for Agriculture project, had two major components: (1) data quality control and generating updated climate datasets; and (2) integrating the newly generated datasets into Meteo Rwanda’s maprooms. Sixteen Meteo Rwanda staff members received six days of training on data quality control and generating updated climate datasets, and/or 4.5 days of training on developing and maintaining ENACTS maprooms. Dinku T, del Corral J. 2015. 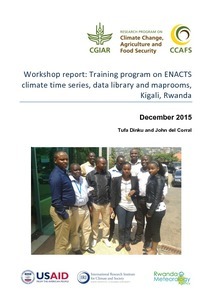 Training program on ENACTS climate time series, data library and maprooms, Kigali, Rwanda. CCAFS Workshop Report. Copenhaguen, Denmark: CGIAR Research Program on Climate Change, Agriculture and Food Security (CCAFS).